I decided to write a singly-linked list, and had the plan going in to make the internal linked node structure immutable. and say I want to append a 5. Or in other words, to do an append, the entire list seems to need to be copied. Is my thinking correct? Is there any way to do an append without copying the entire structure? Is this a good case for mutability? I don't think this is a duplicate of the suggested answer since I'm not talking about the list itself; that obviously has to be mutable to conform to the interface (without doing something like keeping the new list internally and retrieving it via a getter. On second thought though, even that would require some mutation; it would just be kept to a minimum). I'm talking about whether or not the internals of the list must be immutable. With lists in functional languages, you nearly always work with a head and tail, the first element and the remainder of the list. Prepending is much more common because, as you surmised, appending requires copying the entire list (or other lazy data structures that don't precisely resemble a linked list). In imperative languages, appending is much more common, because it tends to feel more natural semantically, and you don't care about invalidating references to previous versions of the list. But note that it doesn't matter if someone else is still holding a reference to 2 as the head of their list, because the list is immutable and the links only go one way. There's no way to tell the 1 is even there if you only have a reference to 2. Now, if you appended a 5 onto either list, you'd have to make a copy of the entire list, because otherwise it would appear on the other list as well. You are correct, appending requires copying the whole list if you are unwilling to mutate any nodes in-place. For we need to set the next pointer of the (now) second-to-last node, which in an immutable setting creates a new node, and then we need to set the next pointer of the third-to-last node, and so on. I think the core problem here is not immutability, nor is the append operation ill-advised. Both are perfectly fine in their respective domains. Mixing them is bad: The natural (efficient) interface for an immutable list emphasized manipulation at the front of the list, but for mutable lists it is often more natural to build the list by successively appending the items from first to last. Both choices are fine, but the implementation should mirror the interface: A persistent data structure benefits from immutable nodes, while an ephemeral one needs internal mutability to actually fulfill the performance promises it implicitly makes. java.util.List and other interfaces are ephemeral: Implementing them on an immutable list is inappropriate and in fact a performance hazard. Good algorithms on mutable data structures are often quite different from good algorithms on immutable data structures, so dressing up an immutable data structure as a mutable one (or vice versa) invites bad algorithms. While a persistent list has some disadvantages (no efficient appending), this need not be a serious problem when programming functionally: Many algorithms can be formulated efficiently by shifting the mindset and using higher-order functions such as map or fold (to name two relatively primitive ones), or by prepending repeatedly. Furthermore, nobody is forcing you to use only this data structure: When others (ephemeral, or persistent but more sophisticated) are more appropriate, use them. I should also note that persistent lists have some advantages for other workloads: They share their tails, which can conserve memory. If you have a singly linked list you will be working with the front if it more than you would with the back. Functional languages like prolog and haskel provide easy ways to get the front element and the rest of the array. 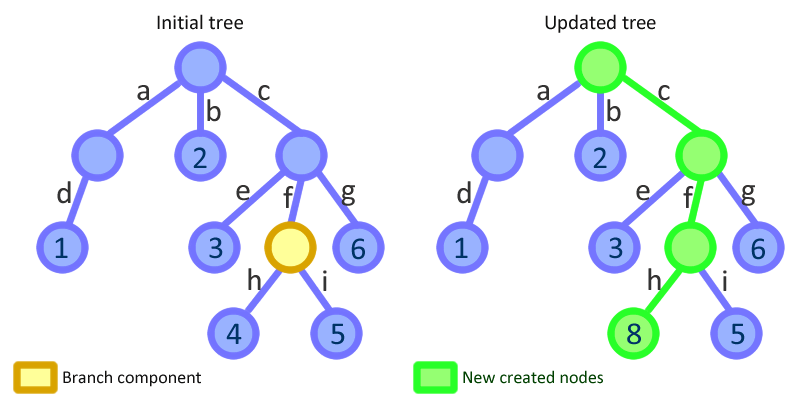 Appending to the back is a O(n) operation with copies each node. As others have pointed out, you are correct that an immutable singly-linked list requires copying the entire list when performing an append operations. Often you can use the workaround of implementing your algorithm in terms of cons (prepend) operations, and then reverse the final list once. This still needs to copy the list once, but the complexity overhead is linear in the length of the list, whereas by repeatedly using append you can easily get a quadratic complexity. Difference lists (see e.g. here) are an interesting alternative. A difference list wraps a list and provides an append operation in constant time. You basically work with the wrapper as long as you need to append, and then convert back to a list when you are finished. This is somehow similar to what you do when you use a StringBuilder to construct a string, and at the end get the result as a String (immutable!) by calling toString. One difference is that a StringBuilder is mutable, but a difference list is immutable. Also, when you convert a difference list back to a list, you still have to construct the entire new list but, again, you only need to do this once. It should be quite easy to implement an immutable DList class that provides a similar interface as Haskell's Data.DList. Since it's a Scala data structure, it can be used from Java too (with a bit more verbosity). It's based on a data structure available in Clojure, and I'm sure there's a more "native" Java library offering it as well. Also, a note on constructing immutable data structures: what you usually want is some sort of "Builder", which allows you to "mutate" your "under-construction" data structure by appending elements to it (within a single thread); after you're done appending, you call a method on the "under-construction" object such as .build() or .result(), which "builds" the object, giving you an immutable data structure that you can then safely share. An approach which can sometimes be helpful would be to have two classes of list-holding objects--a forward-list object with a final reference to the first node in a forward-linked list and an initially-null non-final reference which (when non-null) identifies a reverse-list object holding the same items in the opposite order, and a reverse-list object with a final reference to the last item of a reverse-linked list and an initially-null non-final reference which (when non-null) identifies a forward-list object holding the same items in opposite order. Prepending an item to a forward-list or appending an item to a reverse-list would merely require creating a new node which links to the node identified by the final reference and creating a new list object of the same type as the original, with a final reference to that new node. Appending an item to a forward-list or prepending to a reverse-list would require having a list of the opposite type; the first time that is done with a particular list it should create a new object of the opposite type and store a reference; repeating the action should reuse the list. Note that the external state of a list object will be considered the same whether its reference to an opposite-type list is null or identifies an opposite-order list. There would be no need to make any variables final, even when using multi-threaded code, since every list object would have a final reference to a complete copy of its contents. If code on one thread creates and cache a reversed copy of a list, and the field in which that copy is cached isn't volatile, it would be possible that code on another thread might not see the cached list, but the only adverse effect from that would be that the other thread would need to do extra work building another reversed copy of the list. Because such action would at worst impair efficiency, but would not affect correctness, and because volatile variables create efficiency impairments of their own, it will often be better to have the variable be non-volatile and accept the possibility of occasional redundant operations. Not the answer you're looking for? Browse other questions tagged java immutability linked-list or ask your own question.